I'm not going to lie.........I made these on the weekend. Not much clean cooking and eating going on here the past two days. My sweet girl (#2) turned four today. We celebrate Ukrainian style - or maybe its just how my mom always did birthdays but its more like a Birthweek than a Birthday. We went out for dinner yesterday and had cake (cheat #1 was Perkins pancakes........and cheat #2 was cake). Today was the actual birthday so we had cookies and donuts - we needed the donut for something to hold the candles (cheat #3 - leftover cake and a bite of donut). Tomorrow we are celebrating with the other grandparents and we are having a party on the weekend with friends. So likely a few more cheats to come. In my defense, I am being tested for Celiac in three weeks. In order for the test to actually work you need to eat wheat products everyday for the three weeks leading up to the test. So I have been ordered by my doctor to eat wheat. Its true. I was kind of annoyed about the whole thing after working so hard on eliminating it but the upside is pancakes and cake. Okay - I could have picked less sugary wheat products but it coincided with a birthday - it was fate. I actually don't think I have Celiac but I think its time I ruled it out for sure. So I will be eating some wheat products over the next few weeks but in very limited amounts and I'll still be keeping it out of my recipes. I will get back on track after tomorrow's Birthday party with some whole grains. I have actually been eating clean otherwise. I have to or my stomach lets me know its angry pretty fast. Anyway - these ribs I made on the weekend were awesome. 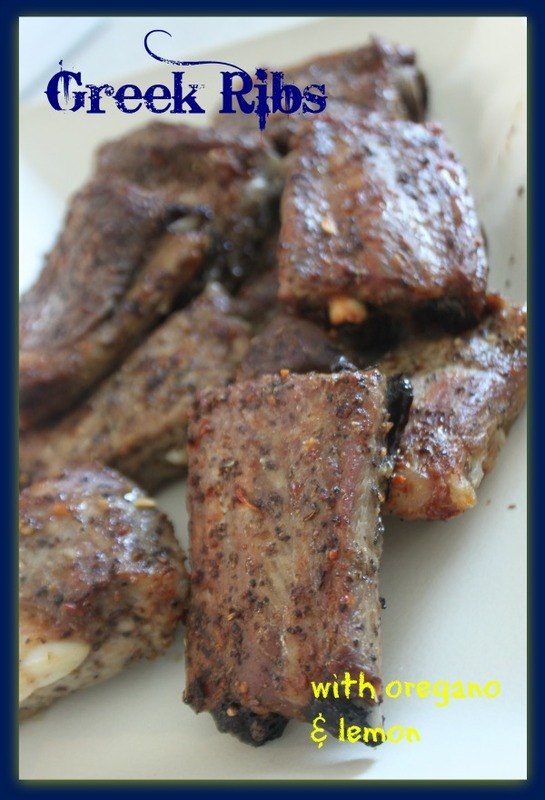 Its a perfect and quick base rib recipe that always turns out tender. Serve with a Greek salad and you have a great clean, low-carb meal. Enjoy! 1) I cut the ribs into 3 or 4 ounce portions, basically two or three bones per section. 2) I mixed together the "rub for ribs". I drizzled the ribs with olive oil and then spiced by thoroughly rubbing the spices into all sides of the ribs. I squeezed the juice from one lemon on top and let them marinate for a couple of hours in the fridge. Optional but obviously the longer they marinate the better. 3) Preheat oven to 450 degrees. Bake the ribs (single layer) on a parchment lined cookie sheet or 9 x 13 casserole for 20 minutes at the high heat. After 20 minutes turn the heat down to 350 degrees and cook for another hour.